There is a pasta war going on in our house. I grew up eating pasta, and I love it. It’s my go-to meal if I’m short on time…and money. My lovely boyfriend, Casey, however, hates it. Hates. WHO HATES PASTA? I mean, pasta is something you feed a picky kid who won’t eat what everyone else is eating. It’s versatile, and takes on whatever flavors you add to it. It’s filling, cheap and satisfying. But no. The pasta war has begun. Last night, I took a strike against the Pasta Nazi. I made Tagliatelle with Smashed Peas, Sausage and Ricotta Cheese from Giada De Laurentiis’s Giada’s Kitchen: New Italian Favorites. Now, I’ve got to say, this isn’t a recipe I would have chosen if it was just for me. But I wanted to appeal to Casey’s tastes. It has Italian sausage in it. Sausage…guys like sausage, right? Sure. This would be perfect. Well, when Casey came home from work, the inevitable question arose, “What’s for dinner?” I immediately became defensive. “Pasta. And you’re gonna like it.” I was on the defensive. Uh oh. Not a good approach. The pasta war was on. With a fury. Fine, I took the wrong tactic. But after a few apologies for being a bit, um…irrational and CRAZY, the guns were down. Maybe I should have made this face. You can’t say no to this. After all this, it turns out I didn’t really love this recipe. 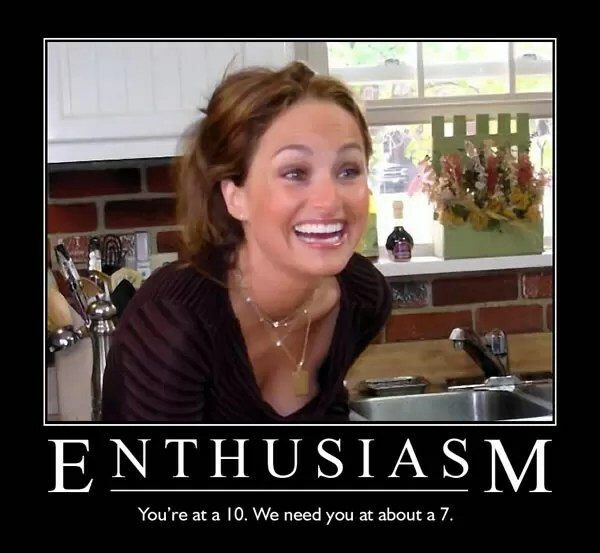 I mean, Giada is the queen of pasta. She is great. She can do no wrong. But the ricotta was a little too “textural” for me. I think if I was to make this again, I would replace the ricotta with mascarpone for a more creamy texture. It also lacked something. I’m not sure what yet, but when I figure it out, I’ll let you know. Either way, if you are a ricotta fan, you will love this. Or a pea fan, for that matter. But don’t expect to win any wars with this one. Bring a large pot of salted water to a boil over high heat. Add the pasta and cook until tender, but still firm to the bite, stirring occasionally, 8 to 10 minutes, or according to the package instructions. Meanwhile, heat the olive oil and garlic in a large, heavy skillet over medium-high heat, until the garlic is fragrant. Add the sausage and cook, using a wooden spoon to break it up into bite-size bits. When the sausage has browned, about 5 minutes, push it over to one side of the pan. Add the peas to the pan and, using the back of the wooden spoon, smash teh peas. Turn off the heat. Add the ricotta to the pan and stir to combine. Then add the cooked pasta and toss to coat. If needed, add the pasta water 1/4 cup at a time to moisten pasta. Add the basil, Pecorino and salt. Serve immediately. I could not find any tagliatelle for the life of me, so I substituted vermicelli. Definitely save some pasta cooking water and add it at the end, a little at a time. It thins out the thickness of the sauce, to make it a little creamier. If you don’t like ricotta, substitute mascarpone cheese. It would make the sauce lovely and creamy.